Dr. Stokman is a graduate of the University of Nebraska- School of Medicine. He completed his internal medicine internship and residency at the University of Minnesota. 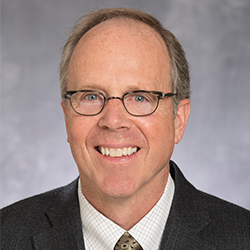 Dr. Stokman completed a Cardiology Fellowship at the University of Minnesota and currently practices Cardiology at the Minneapolis Heart Institute on the medical campus in Crosby. He is Board Certified in Internal Medicine and Cardiovascular Diseases. He is also certified by the National Board of Echocardiography. Dr. Stokman has special interests in echocardiography, nuclear medicine, and preventative cardiology. He joined the medical campus in Crosby in 1990.